Born and raised in Sheffield, UK Richard studied in London. Once qualified, he worked as a chef before moving to the wine trade. Richard got a basic winemaking diploma by correspondence and traveled as a cellar-hand to various countries – California, Chile, France, Germany, Hungary and finally South Africa in 1999. Richard became assistant winemaker at Mulderbosch where he then took the opportunity as winemaker at Nelson Estate in Paarl for 2 seasons before becoming Cellarmaster at Kanu in 2003 and then as Group Winemaker of both Mulderbosch and Kanu in late 2009. 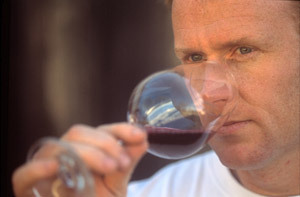 In 2011 he left to pursue his dream of making his own wine from his farm in Elgin, South Africa. In the same year Richard passed his International (British) Master of Wine and becomes the second residential South African and first South African winemaker in South Africa.